Video conferencing organizers can now record video conferences without costly and sophisticated solutions. Epiphan’s recorders series offers high-performance solutions that allow streaming and recording of video conference events. These products are an effective means of delivering different audio-video conference streams through the network and recording them on solid state memory or to a network storage device. This capability enables a meeting holder to record the conference in high resolution quality for those who could not attend. How does video conferencing work with the VGADVI Recorder™ recording appliance? Read on to know more on this subject. In our example the video conference organizers will stream the display from a video conference along with analog audio, record it and then automatically upload to an FTP server. The first step is to setup VGADVI Recorder so that it is streaming a display source to the internet. Using a simple computer display is a good way to test this setup. Connect the output from the video conference display to VGADVI Recorder DVI In port using a cable and/or adapters. Connect VGADVI Recorder to the Network its Ethernet RJ-45 port. Connect the audio to the recorder’s Audio In port. If you know the URL/IP address of the broadcast stream, use it with your browser or media player to make sure the video/audio feed is streamed over the network. If you do not know the URL/IP address, perform this operation in the step 2. 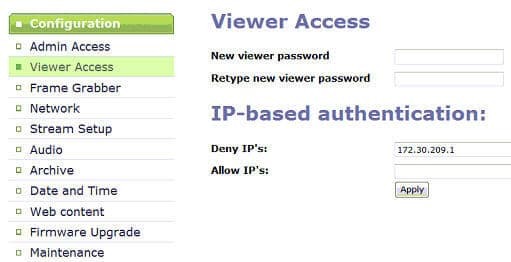 If you do not know the URL/IP address for your VGADVI Recorder installed above, download the Network Discovery Utility from https://www.epiphan.com/support/ to the laptop you are using to configure the system. Install the Network Discovery Utility application on your laptop and start it up. Your recorder will be found on the network. Its IP address will be also available. Provide the participants with this information. Click Web config to start the Web admin interface. Select the Viewer Access section of the interface to set up the viewer’s access to the broadcast. Specify the viewer password. Make sure the FTP server is functioning. 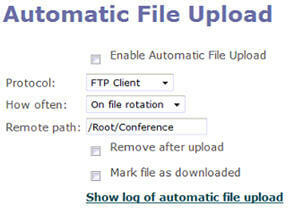 In the Automatic File Upload section of the Web admin interface make settings as shown on the image below. On file rotation means that the VGADVI Recorder device will upload each video file after it stops recording the current video file and starts recording the next one. Set remote path to the path on the upload server to upload the video files to. This path must match an actual path on the server. 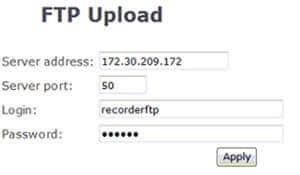 Specify data to access the FTP server and click Apply. The VGADVI Recorder device is now ready to start copying video files to a configured server. Using this approach you can record an audio-video conference and make this record available for remote audience.